A thread where you can post the social networks news of the band and discuss about those news. You can also post any other interesting links. Any Finnish/English fan would like to volunteer for a translation ? ''What about the sequel? Is next year like a new Stratovarius album? Stratovarius, Timo Kotipelto: "Anyone who listens to metal is very intelligent"
During a meeting in May at the White House with the heads of state of some Scandinavian countries, President Obama wanted to emphasize that Finland currently has the largest number of heavy metal band in the world. There is even a heavy band for children, Heavysaurus. We spoke with Timo Kotipelto, leader of Stratovarius, one of those heavy metal band was referring to Barack Obama: "I believe that the phenomenon is bound to melancholy Scandinavian character and the particular climate, with nights that last a season and summers where the sun never sets. You can not play football in the winter and even swim, so heavy metal sounds (laughs)! ". Stratovarius there since the eighties, but reached international fame in the early nineties thanks to a personal style that blends speed and technique with melody and elegance. Kotipelto has joined the band in 1995. We met him in late September at the Rock Festival - Power Metal Edition Space, Live at Trezzo d'Adda (MI). A festival dedicated to the power music, well organized, with plenty of space indoors and outdoors, and a pink band across excellence in both domestic and European metal scene. Punctual Kotipelto welcomes us in the dressing room, it is serene, relaxed, the atmosphere is perfect, from the outside with the beginning of Luca Turilli's Rhapsody that is playing at that moment. In November, you'll be on tour in Finland and you will make a special concert for Episode (the second album in which Timo appears). Can you tell me more? Sure, a couple of years ago we played mostly for fun a selection of old songs and we did everything Visions. Now we would like because they are playing Episode Twenty years after its release, it's my second record in Stratovarius and the first of our current keyboardist (Jens Johansson, editor's note), so we decided to celebrate it. Unfortunately we will do it only in Finland, but if there were requests from abroad we would be happy to accept them. Will be six concerts, you think there are songs I've never sung live, will be a little 'as ristudiarle. You'll have to try a lot then. Yes, we will have to try. The other night we prepared this concert, even if we know the songs is mentally easier if we try the day before. And then, well, we are more united on stage. After this tour in Filand you will take a rest or start working on a new album? We will focus on the composition of new songs. For next year we have not much in the program, a show in February and the festival. Probably we will start working on a new album, but I can not tell when it comes out, probably when the songs will be ready! In this line-up have different ages: a problem or a resource? It is definitely an asset. When Rolf (Pilve, drummer, the youngest) entered the band has brought a wave of energy that brought us to play even better. It 's really a great drummer, is very powerful. In each band, when it enters a new member, something changes. 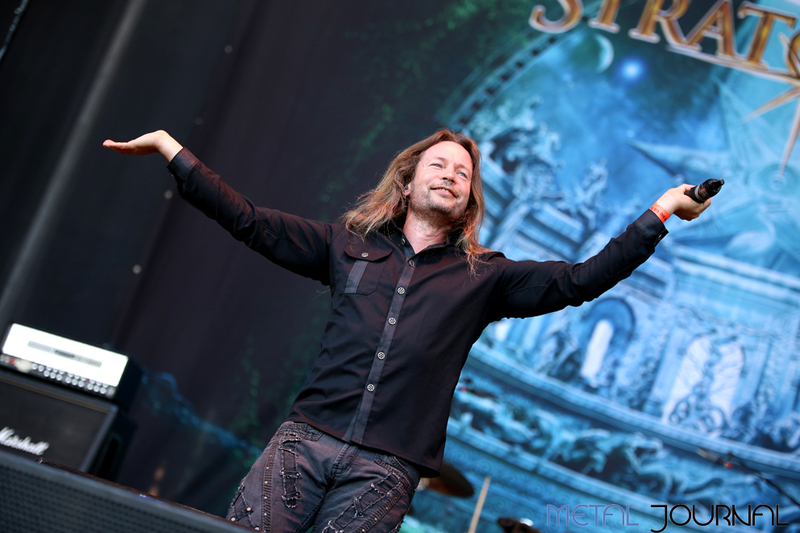 We speak of the lyrics, Stratovarius are very interested in ecology. You think it's important to address certain issues in heavy metal? The situation in the world is not absolutely improving, the oceans are full of plastic, politics is not doing much about it, multinational push people to think the wrong way by pushing them to buy items they do not need. We try to make us think our audience about the nature, precisely because we live in contact with it. I hang out when I compose in the middle of nowhere, even though I lived in the city for twenty years, I love the country. I write about what I'm worried, I'm not a scientist, I do not find solutions, but to reflect. And 'the task of the artists. The other aspect that emerges from our music is positivity. The power metal should energize. What I hope is that the audience singing during concerts back home keep singing, carrying a beautiful memory. Often fans who tell me of a particular concert which was attended ... I do not always remember, but for them that concert was a major event. The music has to give emotions to people. When we write pieces our emotions are there on the table at the disposal of the songs. For Finnish boys is very difficult to talk about personal things, it is easier to write, because we are very shy by nature. Changing topic, according to Zygmunt Bauman ours is a liquid society, where identity is not as strong as before, but is changeable and hard to find their own way. We can extend this concept to the music in general, although as regards the metal seems that over the years has maintained a strong identity. Do you agree? There are some papers in the Finnish press that say that people who listen to metal are very intelligent. One of the reasons why people listen this kind is that they fail to excrete their frustrations. Hardly occur violent episodes in metal concerts. Yes, I agree, I think they have a strong identity and that this music can be helpful. Not just the words, but the same music influence you. It's a bit 'like when expecting a child, he perceives the music, and years later it's like to recognize her. The power metal is not as prevalent as it was years ago, but the most important thing however is that it is still here. There are kinds that disappear after a while, instead bands like Stratovarius have a loyal audience over time. I give you an example, I met today Luca Turilli had not seen for at least ten years, we had been on tour together I fear ago. But when we met it was as if we had left yesterday. It is as if the musicians and their audience were one big family. I understand, first when I arrived I met a person like me listening to metal and had not seen for twenty years, we are friends on Facebook, but we had no verbal exchanges in all that time. In the 80's heavy metal it was more widespread, and it was more tied to a way of life. Today, the listener metal has a normal life, family, children, work. But then you find yourself in the festivals and concerts and the soul of metal resurfaces. Yes, yes exactly! It's a big family. Some of our fans are in their forties and bring their children who are super excited about these events. There are generations that continue. You told me that you saw us to the Leyendas del Rock in Spain, you will then easily realise how music puts people in connection because we move so concert, but then there are also moves to see different countries, it is an exchange of cultures. And the concert becomes a pretext. More pics on the website. You can use google translate for the finnish text. Interview with Mr. Kotipelto & Mr. Johansson + video interview. For Jens Johansson's fans: You'll see him in the videos below. Old news but lots of nice pictures. You can use google to translate the text. The traditional Sauna Club, which is traditionally based on heavy festivals, will be held in the Tampere Park on 28-29. July. In the heavy rock garden festival, the audience can enjoy not only the main stage, the cover stage performers, but also the food and drink, the sauna and the barracks. The main stage performers include Stratovarius, Turisas, Omnium Gatherum and Brother Firetribe. In Kakkoslava Coer Garden, almost 10 of the band's music will be heard by classics from Bon Jovi to Motörhead. The performer band will still grow in the spring. You can also check out this link that gives you an idea of the saunas and the way they listen to music in it, but i don't know if they are the same down there. Nice pics + video + article to translate with the translator : https://translate.google.com/ from italian to wathever language you want.